Barclay James Harvest are an English progressive rock band. They were founded in Oldham, in September 1966 by guitarist/vocalist John Lees, bassist/vocalist Les Holroyd, keyboardist/vocalist Stuart "Woolly" Wolstenholme (1947–2010), and drummer/percussionist Mel Pritchard (1948–2004). Chadderton is a town within the Metropolitan Borough of Oldham, in Greater Manchester, England. It lies along the course of the River Irk and the Rochdale Canal, on undulating land in the foothills of the Pennines, 1 mile (1.6 km) west of Oldham, 4.5 miles (7.2 km) south of Rochdale and 6 miles (9.7 km) northeast of the city of Manchester. North Chadderton School is a mixed gender secondary school and sixth form, located in Chadderton, in the Metropolitan Borough of Oldham, Greater Manchester, England. Melvyn Paul "Mel" Pritchard was the drummer with the British progressive rock band, Barclay James Harvest. 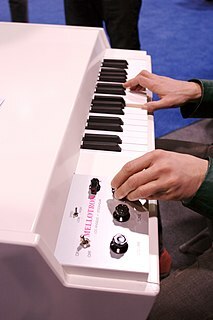 In music, the organ is a keyboard instrument of one or more pipe divisions or other means for producing tones, each played with its own keyboard, played either with the hands on a keyboard or with the feet using pedals. The organ is a relatively old musical instrument, dating from the time of Ctesibius of Alexandria, who invented the water organ. It was played throughout the Ancient Greek and Ancient Roman world, particularly during races and games. During the early medieval period it spread from the Byzantine Empire, where it continued to be used in secular (non-religious) and imperial court music, to Western Europe, where it gradually assumed a prominent place in the liturgy of the Catholic Church. Subsequently it re-emerged as a secular and recital instrument in the Classical music tradition. He recorded a solo album, Mæstoso, in 1980, and toured as support to Judie Tzuke and Saga, as well as writing film and TV music. A projected second album, Black Box, was shelved and Woolly lost interest in the music business, preferring instead to farm, initially in Lancashire and later in West Wales. Tapes from the sessions for his second album were finally issued in 1994, along with the complete Mæstoso album, as Songs from the Black Box. Judie Tzuke is an English singer-songwriter. She is best known for her 1979 hit "Stay with Me till Dawn", which reached number 16 on the UK Singles Chart. West Wales is the western region of Wales. Woolly returned to the music business in 1998 after meeting John Lees again,  and this resulted in the Eagle Records album Nexus credited to Barclay James Harvest Through the Eyes of John Lees. The album was followed by live shows in Germany, Switzerland, Austria, Greece and the UK, the first British concerts by any members of Barclay James Harvest for nine years, and Eagle released a live album called Revival. A studio follow-up with the working title North was planned and recording began at Lees's Friarmere Studios, but after only a few days the project was shelved because Lees felt that due to a number of factors, the timing was not right to do justice to a new album. Eagle Records is an English record label, a division of Universal Music Group and Eagle Rock Entertainment. A new CD of the Black Box sessions with previously unreleased material (including a brand new demo) was released in February 2004 as Black Box Recovered, and a new studio set, One Drop in a Dry World, followed in May 2004. A short UK tour was planned to promote the CD, but in the event only one concert, at London's Mean Fiddler, went ahead, on 12 May. The live set, including rarely heard BJH classics as well as Mæstoso material, was captured for posterity and released on a limited, warts and all live CD, Fiddling Meanly, released in February 2005. On 27 November 2004 Mæstoso played again in London, this time as support to Caravan at the Bloomsbury Theatre. At this show John Lees also made a surprise guest appearance for two songs. Caravan are an English band from the Canterbury area, founded by former Wilde Flowers members David Sinclair, Richard Sinclair, Pye Hastings and Richard Coughlan in 1968. The band have never achieved the great commercial success that was widely predicted for them at the beginning of their career, but are nevertheless considered a key part of the Canterbury scene, blending psychedelic rock, jazz and classical influences to create a distinctive progressive rock sound. The Bloomsbury Theatre is a theatre on Gordon Street, Bloomsbury, in the London Borough of Camden, owned by University College London. This proved to be one of Woolly's most creative periods, with another Mæstoso studio album, Grim, appearing in October 2005, and a brand new album, Caterwauling, released in November 2007. Most of the Maestoso band also found time between recording commitments to perform as part of John Lees' Barclay James Harvest, including a full-scale UK tour in October and November 2006. Woolly Wolstenholme played on all albums of Barclay James Harvest up to XII (1978). The Complete Studio Recordings is a ten compact disc box set by the English rock group Led Zeppelin, released by Atlantic Records on 24 September 1993. It contains all nine of the original Led Zeppelin studio albums digitally remastered, plus an expanded version of the posthumous release Coda. The discs are physically paired together in double-disc booklets and arranged in chronological order, with the exception of Presence being paired with Houses of the Holy in order to keep the two discs of Physical Graffiti together in the same case. Bill Nelson is an English singer, guitarist, songwriter, producer, painter, video artist, writer and experimental musician. He rose to prominence as the chief songwriter, vocalist and guitarist of the rock group Be-Bop Deluxe, which he formed in 1972. Nelson has been described as "one of the most underrated guitarists of the seventies art rock movement". In 2015, he was recognised with the Visionary award at the Progressive Music Awards. FM is a Canadian progressive rock music group formed in 1976 in Toronto. The band existed from 1976 to 1996, with a brief return in 2006, although they had a period of inactivity between 1989 and 1994. Their music has been categorized as space rock, and lyrics are dominated by science fiction themes. In November 2011, Cameron Hawkins reformed the band with two new players. Once Again was the second album released by Barclay James Harvest, in early 1971. It is generally regarded as one of their strongest efforts, featuring powerful, epic tracks such as "Song For Dying", "She Said", and "Mocking Bird", one of their best-known songs. As was the case with their other early albums, it was recorded with a full orchestra. Be-Bop Deluxe were an English progressive rock band who achieved critical acclaim and moderate commercial success during the mid to late 1970s. 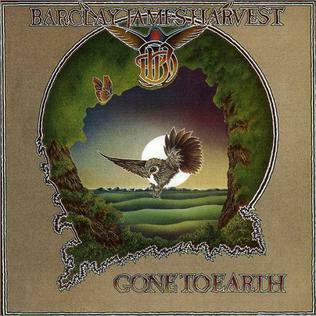 Gone to Earth is an album by the English rock group Barclay James Harvest released in 1977. It reached #30 in the UK charts, but in Germany it peaked at #10 and stayed for 197 weeks in the German album charts. As of 2011 it is ranked #6 on the list of longest running albums in the German album charts. Only the My Fair Lady soundtrack and albums by Simon & Garfunkel, The Beatles (1962–1966), Pink Floyd and Andrea Berg spent more weeks in the charts. It was the band's largest selling album, eventually selling more than a million copies worldwide. Touch was a 1960s progressive rock band who recorded one album, 1968's eponymous and extremely rare Touch. They consisted of John Bordonaro, Don Gallucci, Bruce Hauser, Jeff Hawks (vocals), and Joey Newman AKA Vern Kjellberg. Time Honoured Ghosts is a 1975 album released by the English rock group, Barclay James Harvest. The title was suggested by the wife of Harvey Lisberg, the band's manager at the time, though it is believed that she was quoting from another unknown source. It was recorded between May and July 1975 at the "His Masters Wheels" studio in San Francisco. It was produced by Elliot Mazer and released in October on the Polydor Records label. John Lees is an English musician who founded the rock band Barclay James Harvest. Cobra is a double album featuring a live and studio performance of John Zorn's improvisational game piece, Cobra recorded in 1985 and 1986 and released on the Hathut label in 1987. Subsequent recordings of the piece were released on Knitting Factory, Avant and Zorn's own label Tzadik Records, ) in 2002. Esoteric Recordings is a UK independent record label specialising in 1970s progressive rock, folk, psychedelic, and jazz-rock reissues as part of Cherry Red Records. Its releases include both catalogue reissues and new works from artists who share a similar musical heritage. Barclay James Harvest is the first album released by Barclay James Harvest. Ring of Changes is the twelfth studio album by British rock band Barclay James Harvest, released in 1983. Face to Face is the fourteenth studio album by British rock band Barclay James Harvest, released in 1987. Baby James Harvest was the fourth album released by Barclay James Harvest, in 1972. Songs include "Crazy ", "Delph Town Morn" and "Thank You". Octoberon is the seventh album by Barclay James Harvest, released in 1976. In 2003 a remastered CD was issued with five bonus tracks. In 2017 a 3-disc CD/DVD special edition was released. This features new stereo and surround mixes in addition to the remastered originals, plus the 2003 bonus tracks, one new bonus track, and two videos. ↑ "BARCLAY JAMES HARVEST music, discography, MP3, videos and reviews". Progarchives.com. Retrieved 2012-01-02. 1 2 7d 23h. "WOOLLY WOLSTENHOLME'S MAESTOSO music, discography, MP3, videos and reviews". Progarchives.com. Retrieved 2012-01-02. ↑ Woolly Wolstenholme website. Quote: "It is with profound sorrow that we have to announce the passing of Woolly Wolstenholme. In recent weeks Woolly's mental health had taken a turn for the worse and sadly he took his own life on Monday 13 December 2010. In this difficult time our thoughts are with Woolly's partner, Sue. We would ask all of Woolly's fans to remember his incredible contribution to popular music and his unique presence on stage." The Barclay James Harvest Story by Keith and Monika Domone.